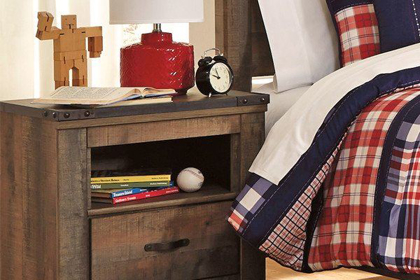 Whether you need to buy your child’s first “big-kid bed”, or a complete bedroom set for a teenager, Wichita Furniture has the largest selection and best prices on kids’ furniture in the Wichita area. You’ll find a variety of styles, including traditional, vintage and contemporary. We carry full and twin size beds, bunkbeds, daybeds and loft beds in both wood and metal. Some come with trundles or built-in shelving and drawers. You can complete the room with a nightstand, dresser and mirror, chest of drawers, bookcase, desk or vanity. With the largest delivery fleet around and the ability to shop online or in-store, we can help parents all over Kansas and northern Oklahoma create the perfect bedroom for a child.